Khenpo Gangshar Wangpo (b. 1925-?) was a highly respected lama in Eastern Tibet and one of the primary teachers of Chögyam Trungpa Rinpoche (the 11th Trungpa tulku). Khenpo Gangshar was trained in Shechen Monastery, a monastic center established in the end of the seventeenth century and part of the Mindröling lineage within the Nyingma tradition of Tibetan Buddhism. Khenpo Gangshar was a primary teacher for Trungpa Rinpoche from the age of 13 until presiding over Trungpa Rinpoche’s kyorpön and khenpo degree examinations at the end of 1957. He was also referred to as a “crazy saint”. Multiple accounts refer to a serious illness which transformed him from a more quiet monk to an unconventional teacher who renounced his vows, entered into a romantic relationship, and often acted strangely or outrageously. According to Chögyam Trungpa in his account in Born in Tibet, Gangshar Rinpoche was tutored by Jamgon Kongtrul the Second of Shechen Monastery. This began when Gangshar’s father died and his mother became a nun. Kongtrul then raised him as his spiritual son, and he became one of six senior professors at Shechen Monastery. Trungpa Rinpoche describes first visiting them both when he was 13 years old, when his studies were to begin in Shechen and a six-month Rinchen Terzod transmission began. Khenpo Gangshar was assigned as his first tutor there and, after completing the Rinchen Terzod cycle, Trungpa (along with about 100 other monks) joined a seminary program that Khenpo Gangshar was leading, assisted by five kyorpöns. When Trungpa had to return to Surmang earlier than expected to take on responsibilities in late 1956 (because of the death of a senior lama there), he requested that Gangshar come to Surmang as his tutor and to lead the Surmang seminary program; the Venerable Khenpo consented. 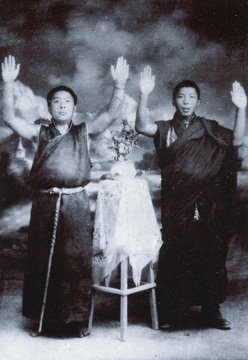 According to Trungpa, in the fall of 1957 and in light of the changing times in Tibet, Khenpo Gangshar instituted radical changes to the seminary. He opened the full range of instruction to any and all laypeople – including women – and asked the hermits with lifelong vows of seclusion to return to the monastery to help teach. It was quite remarkable at the time that a Nyingma professor be asked to serve as the founding dean of a Kagyu shedra (monastic college), but Khenpo Ganshar is most well known for a year of particularly profound and concise teaching following his apparent death. Two years after arriving at Surmang Monastery, Gangshar Rinpoche became very ill and apparently died (according to both Nyingma and Kagyu tradition, he did in fact die). While his body was resting in samadhi, Trungpa Rinpoche sat vigil. At one moment Trungpa’s movement caused a slight breeze, which revived Khenpo Gangshar. For the next year, he exhibited a noticeably different personality (e.g., taking on a consort), rarely if ever slept, and skillfully and uniquely taught every person he encountered the root-essence of Buddhadharma by pointing out the nature of their mind (Dzogchen, Mahamudra). Then one day he announced that he had completed the work that he had returned from the dead to accomplish; returning to his normal personality and routine, he continued as dean of the Surmang shedra until his imprisonment by invading Chinese troops. It was said at the time that he died in prison between 1958 and 1961, but it has also been reported that he survived 22 years of imprisonment and died in 1980 or 1981. Placing my head at the feet of the Dharma King, I offer homage: Bless me that I might see natural luminosity. Hey, you of great fortune! like a tent peg driven into hard earth! like the eyes of a deity in a fresco! At times like these, while resting in the utter brilliance that is the space beyond thought, which may be likened to a cloudless sky, you will experience unimpeded translucence like a faultless crystal. This is none other than the view of the ultimate, the luminous Great Perfection. Resting in equipoise within the pure luminosity, vividly clear like the sky, dullness and agitation are naturally voided and do not arise anew – a faultless, brilliantly clear non-conceptual meditation. When thought arises, be it good or bad, it is recognized for what it is and will not disturb. Focus upon this method and view your genuine nature; effortless, it arises by relaxing into the expanse, and thoughts are pacified on their own ground. When you are able to practice for longer periods, it can be like, for example, when muddy water is stirred up and then allowed to settle – the innate lucidity of the water becomes clearer. Similarly, when myriad appearances arise and are realized to be like reflections, they cause the natural clarity of mind itself to become ever clearer. This in turn leads to the effortless arising of various qualities, such as the various types of clairvoyance and so on. Should even the Great Master of Oḍḍiyāna appear before you, he’d have nothing greater than this to say on the view of the Great Perfection. Should even Longchen Rabjam appear before you, he’d have nothing greater to teach you on the practice of taking thought as the path. Should even the twenty-five exalted disciples appear before you, they’d have nothing greater to say concerning this practice. As for myself, a yogin, this is my practice, and I have no greater meditation instruction to offer you. You may analyze meticulously, but when a wind blows it naturally disperses the clouds and the sky can be seen. Endeavour to see empty clarity, mind itself, in the same way – there is nothing greater than this understanding. If you don’t stir up the silt, the water will remain clear; as such, don’t analyze. Simply rest without contrivance and you will come to see the emptiness of mind itself. There is nothing greater to see than this! There are many views, but that of the emptiness of mind itself, devoid of all grasping, is the unmistaken view of the Great Perfection. When death comes to yogis of this method they are able to seize the clear light of death. Hearing about it is beneficial, but I pray the actual experience of clear light will become evident. Written by the old ignoramus, Gangshar Wangpo. May it prove meaningful!